Gas stations across Iowa, like this Casey's General Store in Des Moines, boast ethanol as "cleaner air for Iowa." Former Florida Gov. Jeb Bush in his West Des Moines presidential campaign office. During a 1999 debate in Iowa, George Bush declared: "I support ethanol, and I support ethanol strongly. I'd support ethanol whether I was in here in Iowa or not." That position helped power Bush to victory in the 2000 Iowa caucuses before eventually winning the White House. The Bush administration created the Renewable Fuel Standard that required ethanol to be blended into the nation's gasoline supply. These days, the Obama administration is proposing to scale back the proposal. Meanwhile, Jeb Bush, the former governor of Florida, has adopted a very different position from his brother on ethanol policy. "I think, ultimately, we need to get to a point where there aren't winners or losers based on subsidies or mandates or anything else," Jeb Bush said in an interview with Iowa Public Radio. That's a common response from Republican presidential candidates these days, and it comes at a time when the ethanol industry is struggling. New fuel-efficiency standards have lowered demand for gasoline — and ethanol — while some critics say the fuel's environmental benefits haven't panned out either. The ethanol industry is trying to stay in the political debate by tracking what candidates are saying about the Renewable Fuel Standard and offering caucusgoers a report card on candidates' positions. "We want to make certain that whoever is in the White House, whether it's a Democrat or Republican, that they understand this issue, that they support it," said Patty Judge, a former Iowa agriculture secretary and co-chair of America's Renewable Future, a bipartisan group funded by the biofuels industry. "Seventy-three thousand jobs in Iowa are in jeopardy if that Renewable Fuel standard should go away, and we just don't want to see that happen so we're going to be pushing pretty hard." One reason presidential candidates aren't pandering to Iowa industries anymore is because the campaigns have become increasingly focused on national audiences rather than Iowans, argues Doug Gross, a prominent Iowa Republican. "You're not going to Iowa and just talking about Iowa," Gross said. "You're going to Iowa and talking about the issues that are involved in your national narrative, because you're trying to drive your national poll numbers, so you can get on the national debate stage, so people can become aware of you." It's just a question of whether Iowa issues — like ethanol — will still fuel that early stretch of road to the White House. Now let's update some of the traditions of the presidential election cycle. It's tradition that Iowa holds its presidential caucuses first, and it's tradition that presidential candidates seeking votes in Iowa discover how much they really love federal subsidies for ethanol. Shameless promotion of that energy is commonly assumed to be a sign of just how badly you want the job, but maybe not this year. Clay Masters of Iowa Public Radio reports on the past and present of ethanol politics. CLAY MASTERS, BYLINE: A new exhibit at the Iowa Historical Museum in Downtown Des Moines is littered with vintage Iowa caucus campaign signs, shirts and other memorabilia. A video plays on a loop boasting about the state's first in the nation status since 1972. UNIDENTIFIED MAN #1: Iowans don't pick the president. We narrow the field and set the stage for the rest of the country. MASTERS: There's a lot of photos here of candidates among corn. Many candidates have been successful in Iowa by supporting ethanol made from corn and used in gasoline. Listen to then-Texas Gov. George W. Bush during a December 1999 debate in Des Moines after his rival Sen. John McCain denounced ethanol. UNIDENTIFIED MAN #2: Just a reminder to the audience you only take away from the time that the candidates have when you do that. I know that it's so tempting. G. BUSH: I was just warming up. MASTERS: That position helped Bush to victory in the 2000 Iowa caucuses and eventually the White House. The Bush administration created the Renewable Fuel Standard. It required that ethanol be blended into the nation's gasoline supply. But these days, the feds are proposing to scale it back. 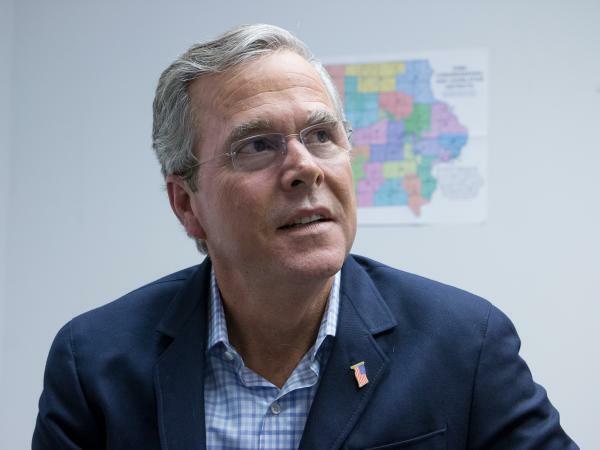 Bush's brother, Jeb, the former Florida governor, is running for president this time. He gave Iowa Public Radio a very different kind of answer about ethanol. JEB BUSH: I think ultimately we need to get to a point where there aren't winners and losers based on subsidies or, you know, mandates or anything else. MASTERS: That's a common response from Republican presidential candidates these days. And it comes at a time when the ethanol industry is in trouble. 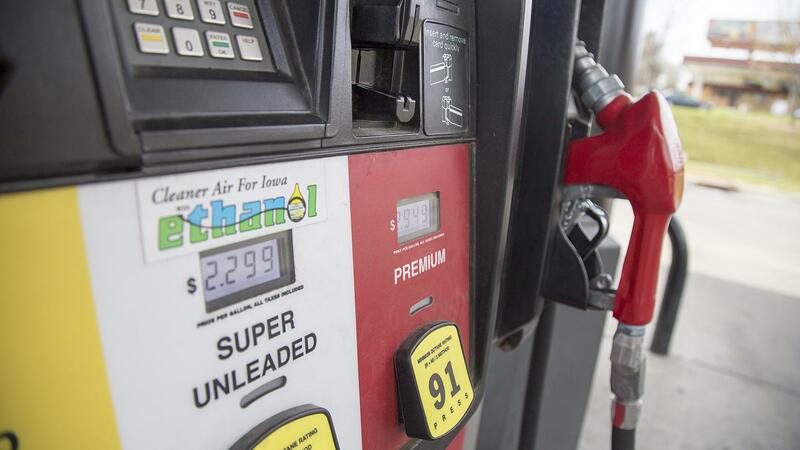 New fuel efficiency standards have lowered demand for gasoline and ethanol. Some critics say the fuel's environmental benefits have not panned out either. But the ethanol industry is trying to stay in the debate. Patty Judge is a former Iowa agricultural secretary and co-chair of a bipartisan group funded by industry. PATTY JUDGE: We want to make certain that whoever is in the White House, whether that's a Democrat or Republican, that they understand this issue, that they support it. MASTERS: They're tracking what candidates are saying about the Renewable Fuel Standard. The group won't endorse candidates, but they will offer caucus-goers a report card. JUDGE: Seventy-three thousand jobs in Iowa are in jeopardy if that Renewable Fuel Standard should go away, and we just do not want to see that happen. So we're going to be pushing pretty hard. MASTERS: The presidential candidates are not pandering to Iowa industries anymore because the campaign stage is very different nowadays, says Doug Gross. He's a prominent Iowa Republican. DOUG GROSS: Well, they still have to play on that stage, but their song they're singing is a national one. MASTERS: Gross says it's a sign that Iowa just does not have the influence over presidential politics that it once had. GROSS: You're not going to Iowa and just talking about Iowa. You're going to Iowa and talking about the issues that are involved in your national narrative because you're trying to drive your national poll numbers so you can get on the national debate stage so people can become aware of you. MASTERS: It's just a question of whether Iowa issues like ethanol will still fuel that early stretch of road to the White House. For NPR News, I'm Clay Masters in Des Moines. Transcript provided by NPR, Copyright NPR.